The new lease standard is effective for fiscal years starting after December 15, 2018 for public entities and after December 15, 2019 for all other organizations. Once you know your effective date, you can determine your Initial Application Date, which is an important date that we describe in more detail at the end of this piece, along with definitions of other key dates for the new lease standard. Many companies find that identifying and analyzing their leases requires more resources and expertise than they have available. Don’t underestimate the requirements for this initial step. In fact, you may want to consider engaging outside advisors from the start to avoid errors and higher costs after implementation. When you are ready to implement the new lease standard, you need to determine when to start each step and what resources are required. To help you with your planning efforts, we have prepared a matrix with related timelines so you know when you need to begin your implementation efforts to leave sufficient time for completion before your Initial Application Date. 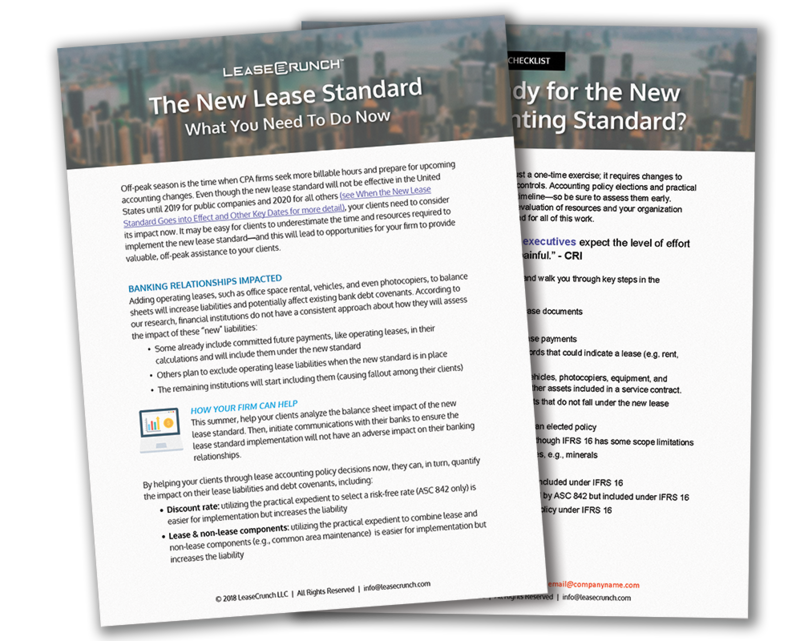 Download the full New Lease Standard guide today! By using this chart, you can estimate how many months you may need for each of the major implementation categories based on your lease population. You can create a timeline of key dates for the new lease standard tailored to your company that will help you to plan and monitor your progress. For purposes of this matrix, we treated all types of leases the same, using a common guideline that each lease will take about three hours to analyze (for more information on the time it will take to analyze leases, see page 37 of this KPMG Presentation). For your planning, consider the complexity of your contracts as well as how many people can dedicate their time to reviewing your leases. If you have 50 reasonably straightforward leases, it might take one person less than a month’s dedicated time to analyze them. However, if there are 40 straightforward leases and 10 complicated ones, you might need to extend your preparation time by a month or more to allow for the proper conversations and decisions to occur. Also, your project team’s familiarity with the new lease standard can impact the time that this will take. Companies should expect more time to review leases initially because the team is adjusting to new definitions, processes, systems, and decision considerations. You will notice that we have overlapped the timing of most implementation stages. 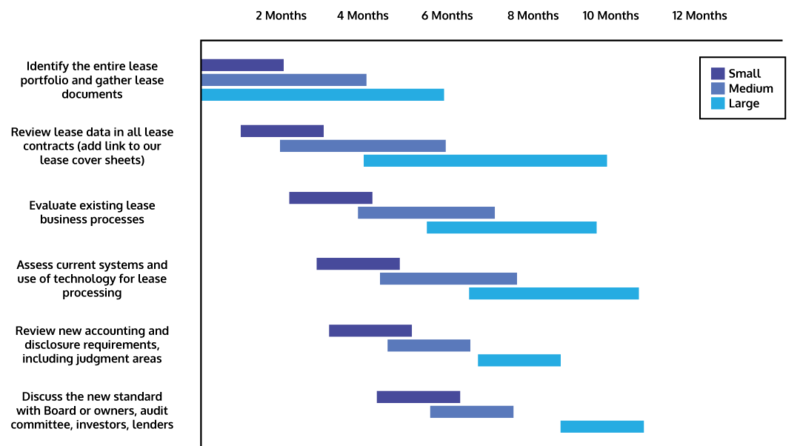 Depending on your resources, your timeline may be linear - starting at a point in time and adding all the numbers of months in the steps sequentially. As a result, your overall timeline could be longer. Using the outcome of this simple analysis, you will have a better indication of how many months before your IAD you must get started to be ready in time. If you find that you do not have sufficient time with your existing planned resources, you may need to involve additional internal resources and/or hire consultants to help you. Many organizations are already planning to outsource components of the new lease standard implementation and it may be the only way to meet your deadlines. The Effective Date is the end of the fiscal year for which you elect to adopt the new lease standard. For example, if you decide to adopt the new lease standard early for your fiscal year ending in 2018 and your fiscal year end is September 30, then your Effective Date is September 30, 2018. Employee benefit plans that file financial statements with the SEC. If this applies to your organization and your fiscal year end is December 31, then your Effective Date is December 31, 2019. For all other organizations, your Effective Date is your fiscal year beginning after December 15, 2019. For example, if you are a privately held company with a fiscal year end of March 31, your Effective Date would be March 31, 2021. Now that you know your Effective Date, you can determine your Initial Application Date. Following the original guidance, this would be the first day of the first fiscal year represented in your financial statements. For example, if your Effective Date is December 31, 2019 and you have three comparative years in your financial reports, your Initial Application Date is January 1, 2017. If your Effective Date is March 31, 2021 and you have two comparative years in your financial reports, your Initial Application Date is April 1, 2019. It is important to note that the FASB recognized that the above guidance requires restating prior years and therefore is a significant amount of work. Therefore, they issued ASU 2018-11 in July 2018, which allows companies to avoid prior-year restatement. For more information about this, please see our blog post: "FASB Amends the New Lease Standard." Using the above example, if your Effective Date is December 31, 2019, you have three comparative years in your financial reports, and you elect the new transition option, your Initial Application Date is January 1, 2019. If your Effective Date is March 31, 2021 and you have two comparative years in your financial reports, and you elect the new transition option, your Initial Application Date is April 1, 2020. An important date for individual leases is the Commencement Date, which is the date the underlying asset is available for use by the lessee. It’s important to note that this may not be the date when the lessee enters into the agreement with a lessor. Lease classification and measurement should take place at the commencement date. Download the full guide to share with your team today!